In our previous blog, we discussed some of the myths regarding owning a home hot tub in North Carolina. We discussed how a hot tub maintenance service can change your thoughts about hot tubs being dirty, how hot tubs are only for the rich, and how more jets means you’ll get a better hot tub experience. Today we’re going to look at a different type of misinformation out there: shortcuts in spa maintenance. 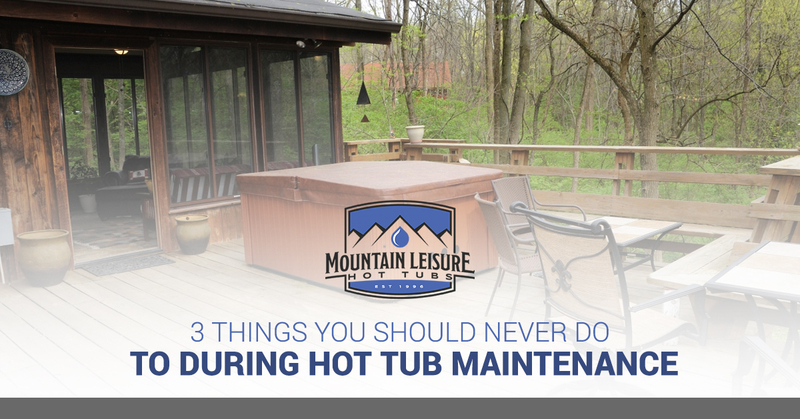 People who take care of their own hot tub maintenance are always looking for ways to save a penny or reduce the amount of work they need to do to keep it sanitary. While we understand the urge, we’d like to help you avoid damaging your hot tub (or your body) when it comes to these horrible internet hacks. Let’s take a look at the advice you should avoid. One of the shortcuts we’ve heard is about putting your hot tub filter into the dishwasher in order to clean it. But filters aren’t made of glass or hard plastic or earthenware; in fact, they’re much more fragile than those types of materials and are more likely to break down in the heat. While filters are sturdy, they’re just not meant to hold up to the vigors that occur in a dishwasher. Instead of using a dishwashing machine, you should rinse the filter off with a garden hose and then soak your filter in a filter cleaning solution according to the solution’s directions. Or you could just have us take care of it with our hot tub service. We can think of one good way to use antifreeze: in a vehicle. Using it in any other way isn’t only risky, but could also be illegal. Here’s the problem. The pipes and hoses that are used in a hot tub are very different from those used in a car or truck. Antifreeze tends to be very difficult to get out of hot tub pipes, which means that it could not only damage the pipes but also come out and affect your skin. It may even react with other chemicals in the water and cause additional health problems. It’s best to use legitimate winterizing methods if you won’t be using your hot tub in the winter. We don’t know why you’d winterize it here in North Carolina, though, because the cold days can be some of the best for hot tubbing! Chlorine gets a bad reputation, considering all of the good it does. In nearly every case, it’s not the chlorine that’s causing your eyes to burn. Most of the time it’s an imbalance in pH that causing eye irritation, which means testing your water with strips to find out in which direction the balance is off. Or you could just have us take care of it with regular spa maintenance. We know that some people want to purchase a new hot tub from us and take care of their own cleaning and chemical balancing, and we respect that. But we can also take care of that for you. If you’re interested in our hot tub maintenance service, contact us today!